You can go to the grocery store and in five minutes walk out with a ready-to-eat, nutritionally balanced meal for your family. Someone else selected and prepared it, saving you valuable time. But it costs you more money, and you give up control of ingredients and preparation. The trade-off is much the same for horses with the advent of, and advances in, pelletized horse feed. Weigh the benefits against the drawbacks. Individual cereal grains suitable for horses vary in nutritional makeup. Pelletized feed manufacturers select, measure and mix these grains together in pellet form. Not only can your horse not choose among his favorite grains; but any vitamins and minerals missing from the individual grains have been mixed in so that you don’t need to add nutritional supplements. You also don't need to struggle with adequate storage of several different grains, or measure out vitamin, mineral, protein or fat supplements your horse may or may not find palatable. Rather, you have one feed, in one bag. All you need to provide is hay or grass, water and salt. Many large pelletized feed manufacturers have in-house nutritionists who stay current on equine nutrition; some have their own researchers. They have become very sophisticated about tailoring pelletized feed for many specific needs and circumstances. 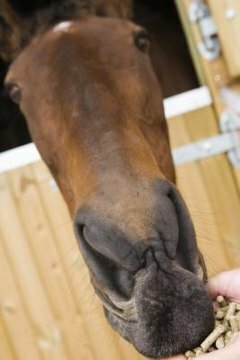 Senior feeds are one example; as horses get older, their teeth are not able to chew and digest hay as efficiently. Senior feeds are “complete,” meaning more forage sources are combined with the grains in pelletized form. Similar adaptations are made for performance horses who need more protein and fat, as well as for pregnant and lactating mares, babies overweight horses and horses with metabolic disorders. Contents and nutrient values are clearly labeled on each bag so you can compare. A lot of knowledge and processing goes into each bag of pelletized feed, and you pay the price. High-quality pelletized fees are not inexpensive, so weigh the cost against time and convenience. You also have to trust the quality control measures of the manufacturer and the processing plants it uses. A feed company may use more than processing plant; even if minimum quality standards are the same for each plant, manufacturing variations can cause quality variations among bags of feed. Every horse is an individual. It’s possible that you might like everything you read on a pelletized feed label except for one thing, maybe an ingredient that you know makes your horse excitable. You can’t remove an ingredient or change its amount. Similarly, if you want more of a nutrient -- for example, oil for extra fat -- and add some to your horse’s serving of pelletized feed, you risk disrupting the nutritional balance that you paid for. Plus you're adding cost and time by adding other supplements to regain that balance.